The Andalucian capital and fourth largest city in Spain. It is also the most populated city in the south of Spain. Also, one of the most visited cities by foreign tourists. It has over 3,000 years of history and is literally a living museum. Visit Seville in the summer and the heat can be unbearable. It is known to be one of the hottest places in Europe. Springtime is more pleasant, which is when we visited Seville. 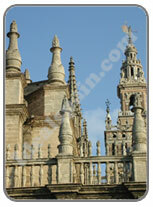 Seville is one of the most beautiful cities that we have visited in the whole of Spain. We managed to see most of it in two days. The city was quite easy to navigate and driving around was unusually calm. The best place to base yourself is in the old quarter, near the cathedral, as we did. From here you can walk to most sights. Here we have outlined just a few of them. The most impressive building in the city has to be the biggest gothic Cathedral in the world, building began in 1401. In total the cathedral houses over 500 works of art, some of which are the most important in the world. See picture, right and above. The tallest tower in Spain stands in Seville, attached to the cathedral, La Giralda (Moorish Tower), 319 feet high, a symbol of the city's importance. The tower is an ancient minaret of the Islamic Mosque and was erected in 1184. its foundations utilise stones from Roman monuments. 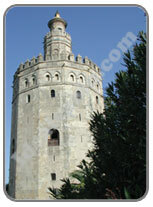 The Torre del Oro or Golden Tower (pic below) was built between 1221 and 1222 and was one of the last contributions from the Almohade period in Seville. 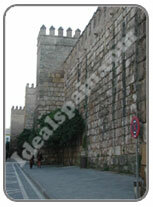 It formed part of the last wall of defence that ran from the Alcazar to the river. It is said that it gained its name from the sun's reflection on its gold tiles that once covered the dome. Today it houses the Naval Museum and all the gold has sadly been stolen. You will find it alongside the river, close to the bullring. The Alcazar is a collection of Moorish Palaces on which building began in 931. It has over the years been the residence of many monarchs. The buildings and gardens are enclosed by walls and lined with orange trees. The entrance into the Patio de Banderas is pictured above. The Casa de Pilatos (House of Pilate), was built at the end of the 15th century and was later extended. The archaeological gardens house some interesting statues and marble works. The Monasterio de la Cartuja dates back to the 14th century. The site was ransacked during the French invasion and the monks were expelled in 1835. Shortly afterwards it became a ceramics factory. The Plaza de Toros (bullring) is an 18th century construction that initially was built of wood. In 1761 its enclosure in stonework began. After delays caused by the Spanish Civil War, it was completed in 1881. The museum in the bullring offers an insight into the history of bullfighting. The beginning of the bullfight season takes place on Easter Sunday and finishes in September. La Calle Feria (Feria Street) is one of the longest streets of the city and has always been noted for its history and its charm. he street is lined with shops and workshops and runs from Resolana Street to San Juan de Palma Square. Every Thursday the street is the scene of a traditional market where stalls feature everything from paintings to antiques and furniture. The public market is also located on this street and is worthy of a visit. Some of the important buildings on the street include a Gothic church and the remains of a palace. Feria Street is a good place to start your tour of the city if you are short of time. The Plaza de España (see photo right) is a ´must see` with it's beautiful fountain, surrounded by a large plaza and an artificial river. Around the plaza stands a monument that forms a vast semi-circle of 200m diameter, with a tower at each end. Along the front are benches, covered in colourful tiles, each one dedicated to a province of Spain. They are placed in alphabetical order. Each province is separated by small cupboards designed to house a basic library on each province. Inside the building you can visit the spectacular patio with it's two floors, arches and columns. 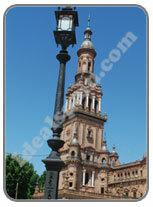 Seville also has a wealth of culture to offer the visitor and the city boasts several important theatres. Pictured below is the Cupola of the Casino that is joined to the Lope de Vega Theatre. The dome was built for the 1929 exhibition in the city. Museums in Seville also include the Carriage Museum, housing a unique and very important collection of historical transport and the Archaeological Museum which is housed in a palace and has 27 rooms containing artefacts from Iberic, Phoenician, Carthaginian and Roman villages around Seville. For the Expo '92, Seville underwent massive changes, opening her doors to the world. The new Golden Gate Bridge became a wonderful attraction and an Expo complex of huge proportions was constructed on the south side of the Rio Guadalquivir. It is here that you will find the huge discoveries park, the Olympic stadium and the theme park. You will also see a little of the old city walls, still intact. 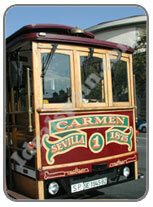 Seville has its own airport and well serviced train and bus stations and is therefore easy to get to. If you get chance, why not take a trip along the river on one of the several tourist boats or take a tour round the city on the open top bus or public tram. You can obtain details of these and many other things from one of the tourist offices. The easiest to find is the one on Avenida de la Constitucion, 500 metres from the cathedral. Massive events in Easter Week (Semana Santa) in March/April. April Fair (Feria de Abril) and Rocio Monday in May/June. There are many places in Seville to see Flamenco shows which are very popular. Contact the tourist office for details. Seville's weather may be labelled as warm-hot. Long, dry and hot summers and warm winters. Annual average temperature is 18.2oC, raising to 26.6o in July and August, although it can reach 40-42o. It rarely falls below 2-3o even in the winter and rain is scarce. Whilst in the area of Seville, you may wish to visit the Roman city of Italica. The massive complex of Roman ruins is one of the most important in Spain and is located about 20 minutes north of the city. Follow the signs in the direction of Merida, to the little village of Santiponce. See a report of our visit here.